If you have recently updated from an older installation of Event Espresso 4 the Batch message type may need to be activated. 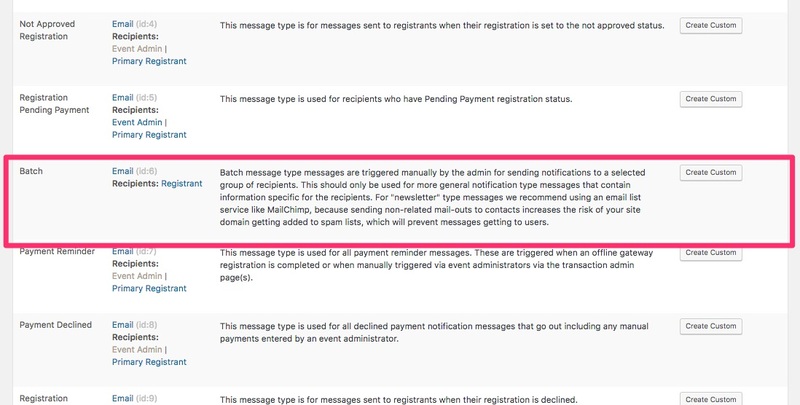 You can activate the Batch message type on the settings screen for the Messages system (Event Espresso –> Messages –> Settings). Once on this page, you click and drag the Batch message type and move it to the active box. Custom newsletter messages can be created by clicking on the Create Custom button that appears on the default Batch message type row. Alternatively you can edit and use the default message. New templates will appear in the custom templates tab in the Messages admin screen. To send, you go to the registrations screen for the event, select the registrants, and scroll down past the list where you can click on the Send Batch Message button. A modal will display where you can select a template and make edits to the newsletter message. Once it’s ready to send, you click the Send button.